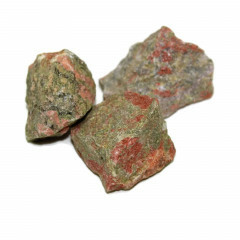 An interesting semi precious stone – it is a mixed green and pink stone comprised of several minerals including Epidote. An interesting stone made of an amalgamation of Epidote, clear Quartz, and green Feldspar – it is commonly found on the shores of Lake Superior, on the US / Canadian border. It is found in several other locations worldwide, including Sierra Leone, Brazil, China, and the state of Virginia. It is named after the mountain range it was originally found in, the Unakas range of North Carolina. 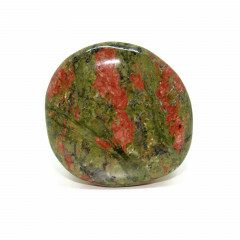 It is sometimes referred to as ‘Epidote Granite’ or ‘Epidotized Granite’, or ‘Unakite Jasper’. 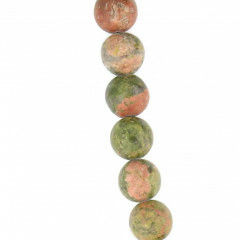 It can be finely polished, and is used for cabochons, beads and pendants, in fairly low end jewellery, as well as being carved or tumble polished by lapidarists. 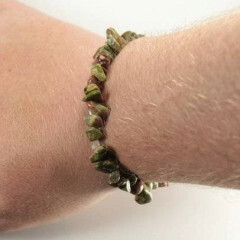 This stone is considered to combine the powers of pink and green stones. Pink and red stones are thought to aid in romantic matters and love, and green stones are meant to bring renewal and good health. 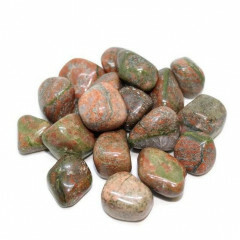 As such, Unakite is meant to help with any relationship problems.